Houdan chickens were commonly kept in France as a meat bird. It’s surprising that they could eat something so beautiful, but I suppose it made a nice change from snails and frogs legs. They are very similar in appearance to the Polish breeds with their top knot. A few statistics of this trade in the neighbourhood of Houdan will give a correct idea of its importance. At the markets of Houdan, Dreux, and Nogent-le-Soi, there are sold annually upwards of 6,000,000 fat poultry. ” The Houdans may certainly be regarded as the Dorkings of France. 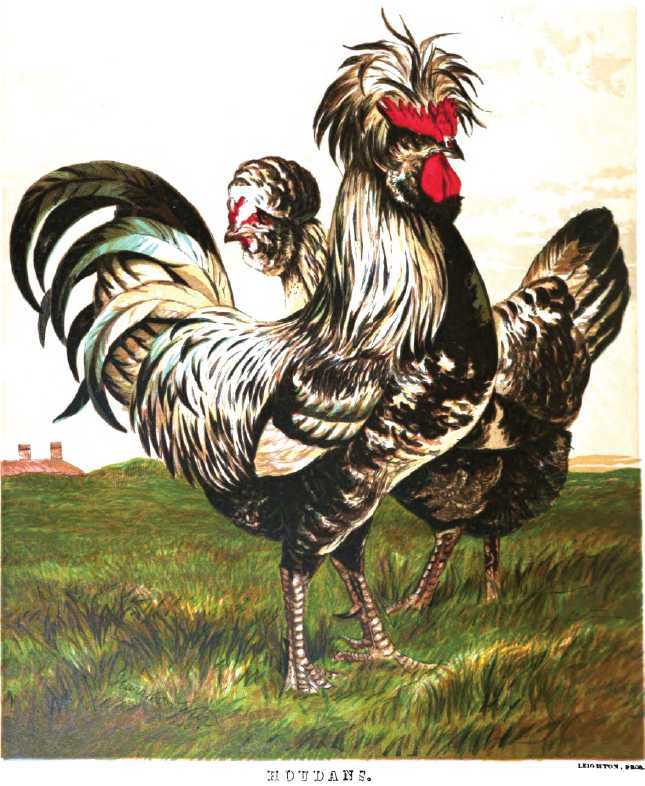 Large, heavy, short-legged, five-toed fowls, with small, light bone, a remarkable absence of offal, and with irregularly speckled or mottled plumage, they strongly recall to mind the old-fashioned coloured Dorking, as it existed before any attention had been directed to uniformity of feathering by the poultry shows. Their merits as table fowl are of the highest excellence. No pure-bred chickens mature with greater, or perhaps with as great a degree of rapidity; they feather early, are extremely hardy, and are consequently easily reared.